The Waray are an ethno-liguistic group of people geographically inhabiting in the islands of Samar, Leyte and Biliran - commonly referred to as the Eastern Visayas region of the Philippines. The Waray, speak their native language called Waray-Waray. 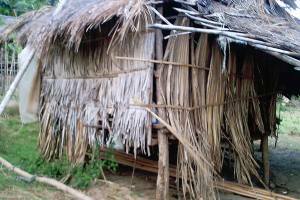 Waray people inhabit in the whole island of Samar and they are called Samareños while in the island of Leyte they are called Leyteños. In Leyte Island, Waray people occupy only in the northern part of the island as it is divided by a mountain range in the middle of the island. Hence, the language division between the Waray-Waray speaking people in the northern part and the Cebuano speaking people in the southern part. In the island of Biliran, Waray-Waray speaking people lives on the eastern part of the island facing the island of Samar. They are commonly referred in Waray-Waray term as Biliranon. In the island of Ticao which belongs to the province of Masbate in the Bicol region, Waray-Waray speaking people lives in most parts of the island. They are commonly referred to as Ticaonon. However, the Ticaonon have their affinity with the Bicolano speaking people of Masbate Island as it is their home province. Bicol and Waray-Waray languages have a lot of similarities in vocabularies as compared to Cebuano language. The Waray people form the majority of the population in the provinces of Samar, Northern Samar, and Eastern Samar, while they form a significant population in Leyte and Sorsogon. The Waray people are one of the most religious people in the Philippines. Almost all of them belong to Roman Catholicism, the world's largest Christian denomination. Their religious devotion is very evident in their celebrations like feasts honoring their patron saints, Santa Cruzans and many more. The Waray people speak the Waray-Waray language, a major Visayan language. They also speak Cebuano as their second language. Some people who are of Waray descent also speak Waray-Waray as their second or third language, especially among emigrants to Metro Manila, other parts of the Philippines and in other parts of the world. Other notable foreign languages spoken include English, Spanish, Chinese and Japanese which is spoken by its community and among others.